People from America to Zimbabwe will begin scooping up a cup of the local agua this month, sharing their findings with the world as part of the World Water Monitoring Challenge. What started as a one day celebration of the Clean Water Act is now an international awareness event with a quarter million participants spanning time and space to raise awareness about water quality. “Water monitoring is really one of the tools that we use to get (people) out to their waterways,” said Lorien Walsh, who manages the program for the Water Environment Federation. On Oct. 18, 2002, America’s Clean Water Foundation started World Water Monitoring Day on the anniversary of the Clean Water Act. “They realized quickly that there was interest in the program more broadly on an international level,” said Walsh. The next year, ACWF joined with the International Water Association to encourage international participation. Just a few years later, America’s Clean Water Foundation dissolved. It left a void in organizational responsibility for World Water Monitoring Day. That’s when the Water Environment Federation caught the hot potato. Walsh described the transition as a “natural fit,” noting the organization wanted to raise more awareness for the importance of water quality. If the schedule broadened, Walsh and her team thought, groups will sample. So they turned the one day event into a ten month challenge, from March through December. The idea worked. With the help of community groups across the globe, like the Girl Scouts of America, Spanish water quality organization Adecagua, and many others, participation grew tremendously. During the first World Water Monitoring Day coordinated by WEF in 2006, there were 28,150 documented site visits submitted. Participation grew nearly nine times with more than 250,000 site visits documented by 2012. Groups from 66 countries partook in the 2012 event. WEF and IWA provide water monitoring test kits to challenge participants. In developed countries, groups purchase their testing equipment. The program donates test kits to groups in the developing world. The simple and intuitive kits include tablets that dissolve in water samples and change color to indicate pH and dissolved oxygen levels. 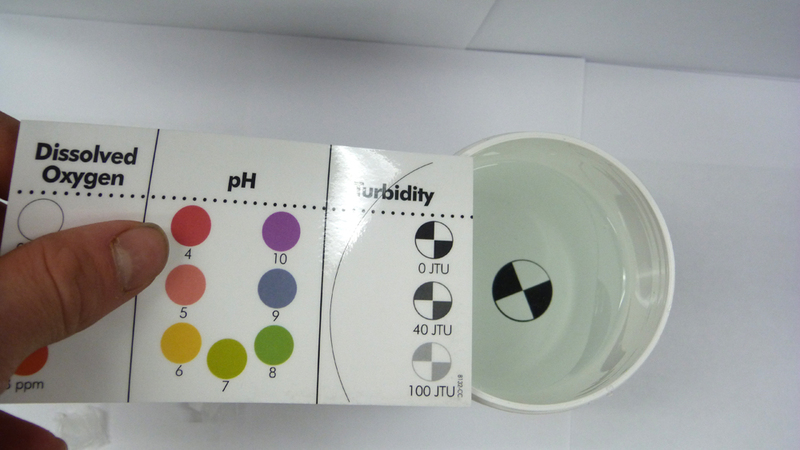 The cup containing the components doubles as a sampling container and is used to measure turbidity with a Secchi disk decal attached to the bottom. Simple instructions make it easy for the most scientifically inept to easily gauge the health of their waterways. Walsh said the kits are meant to give people a general indication of the health of their waters. She encourages conducting additional tests for more complete results. Participants are also welcome to add parameters or use their own instrumentation to collect data. Site visits can be logged into a database on the World Water Monitoring Challenge website. Top image: World Water Monitoring Challenge participants from Maclay School, Tallahassee, Fla.